A notorious Craft Wanker loiters outside the brewery, begging for slops. This was the glowing recommendation given to me by Melissa Cole. Broadly speaking, Melissa is right. 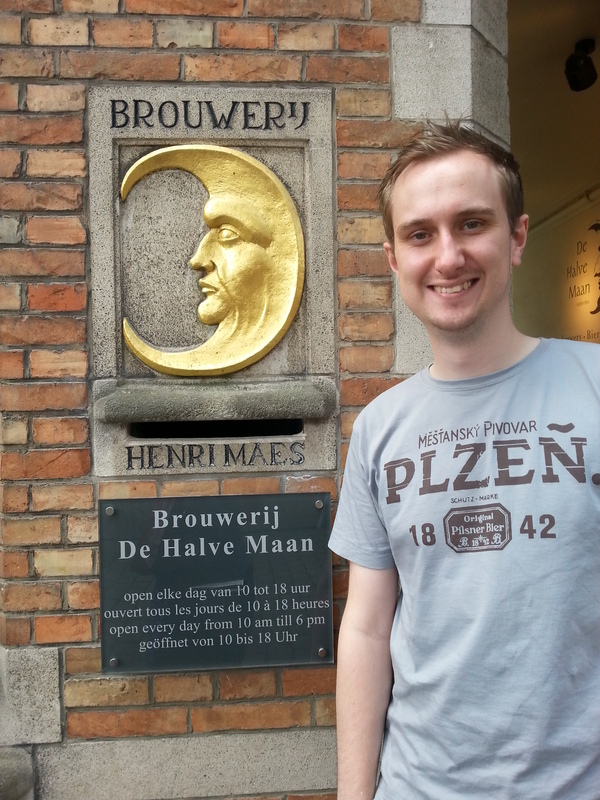 On the tour of Brouwerij De Halve Maan, brewers of Bruges Zot and Straffe Hendrick, you will hear a few things that might get your Beer Geek hackles up. There’s also a lot of stuff about the magical medicinal properties of all of the ingredients, which is mostly fun if occasionally presented as fact. These minor quibbles aside, it really is a fantastic tour, and a lovely building to explore. 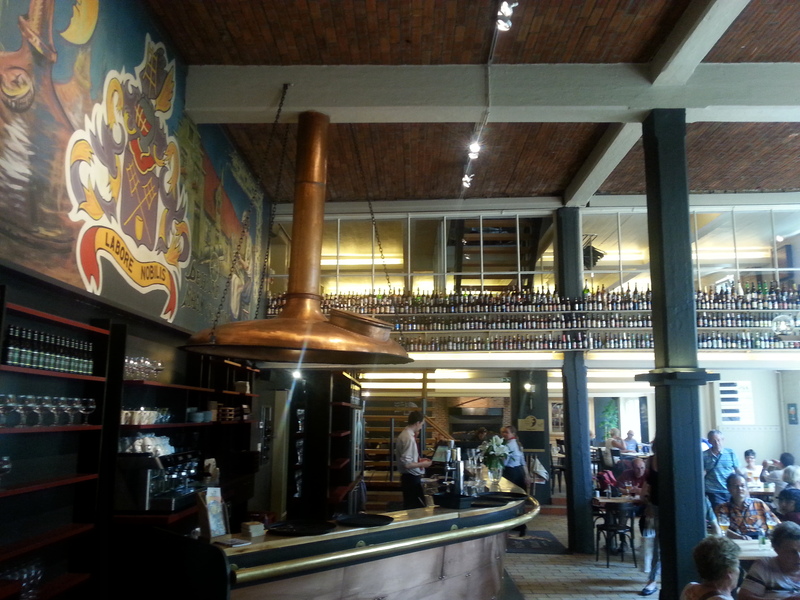 It isn’t immediately obvious from the exterior that De Halve Maan was an old-fashioned tower brewery. The building above, with its coaching inn-style tunnel, sits in front of a courtyard where a restaurant and gift shop is located. Once you’ve bought your ticket for a very reasonable €7 (including a beer at the end), you simply have to wait until the next tour starts, which is on the hour. The tour starts in the shiny, modern brewhouse, where everything is situated on one floor. Everything is clearly labelled for visitors, and the brewing process is briefly explained. Whilst it looks as clean and new as, say, Camden Town Brewery, there is still a reassuring adherence to old-fashioned eccentricity. The control board below, for example, has a delightfully steampunk feel to it. Why have a touchscreen when big, pushable buttons and levers will do the trick? It reminded me a bit of Bertha, the magical factory machine from the kids’ TV show of the same name. The real treats are upstairs. As mentioned above, originally De Halve Maan functioned a tower brewery, relying on gravity to propel the liquid through the brewing process. So up, up, up we go, ascending narrow steps and low ceilinged passages into the malting floor. 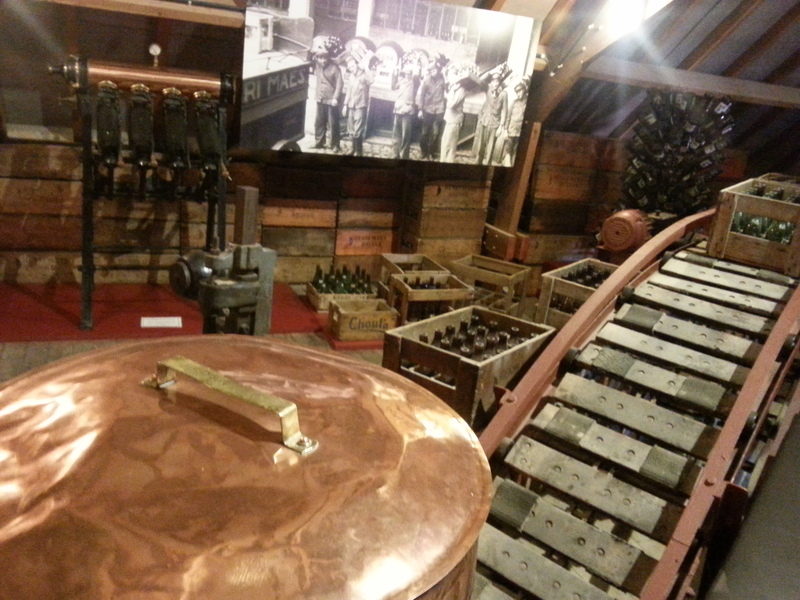 Here there are all kinds of fine-looking brewing artefacts from the brewery’s 150 year history. It’s here on the malting floor you get a more in-depth talk about the value of each specific ingredient in the process. The tour guide, whose name I can’t remember, won me over after sizing up a chap who had been asking a lot of questions about what was or wasn’t regulated in Belgian brewing: “You’re German, aren’t you?” Cue laughter from everyone. The talk was a fan and factoid-packed, but could be politely described as being ‘unburdened by the truth’. 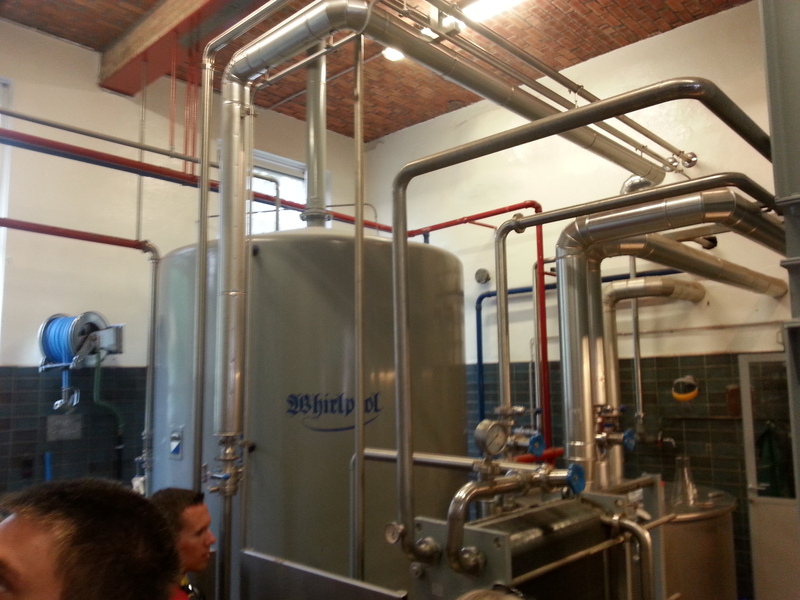 To some extent you could understand the German guy’s constant questions; he admitted he was a homebrewer. However, I could tell that he was asking questions he knew the answers to, and was really just testing the tour guide, which is far worse in my mind that coming up with a few half-baked facts about the medicinal benefits of beer. Anyway, as I said, its the building itself that really makes this tour special. 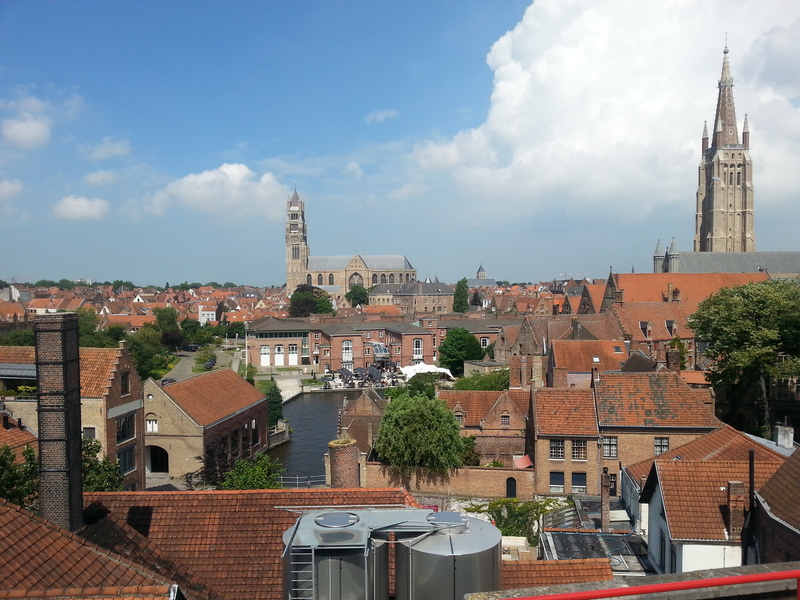 You get to see, or rather walk across, the old koelschip (a broad, shallow, copper vessel where hopped wort would cool down while being exposed to wild yeast and bacteria) on the way to the roof, where you can enjoy a glorious panoramic view of Bruges. Then, climbing down even narrower stairs than before (backwards), you get to see the beautiful old heat exchangers, fermenting vessels and maturation tanks. Tall people beware, you may spend much of the tour in an Igor-like crouch. To the guide’s credit, you will learn a lot of history as well as Beer Facts ™, and there are plenty of stories in the old copper vessels. 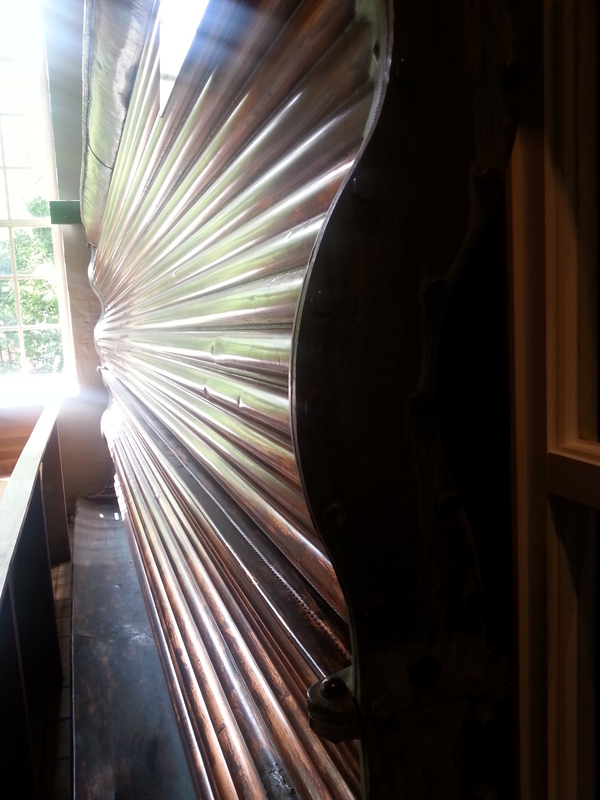 1930’s heat exchangers are pretty. When the tour is over, you’re guided to the lovely on-site bar, where you’re handed a cool glass of unfiltered Bruges Zot, the brewery’s flagship blonde ale. It’s a fairly common sight in bottles in the UK, and a decent Belgian blonde, but by no means exceptional. The unfiltered version (like most unfiltered versions of anything) is a superior product, with a more pronounced, zestier, citrus finish and a smoother, creamier mouthfeel. I can also recommend the Straffe Hendrik Quadrupel, which, whilst not the usual Trappist quad to find beer geeks fawning over, is a really decent drop – full and syrupy sweet, with a moreish balance of toffee, chocolate and coffee notes. If you know a bit about beer and brewing, and have a few people with you who don’t know much at all, then De Halve Maan will give you a very accessible and fun brewery tour. Even if you know a lot, the tour itself is still fun, and any ropey information is completely outweighed by the friendliness of the guide, the beauty of the building, and the delicious beer at the end. €7 well spent. 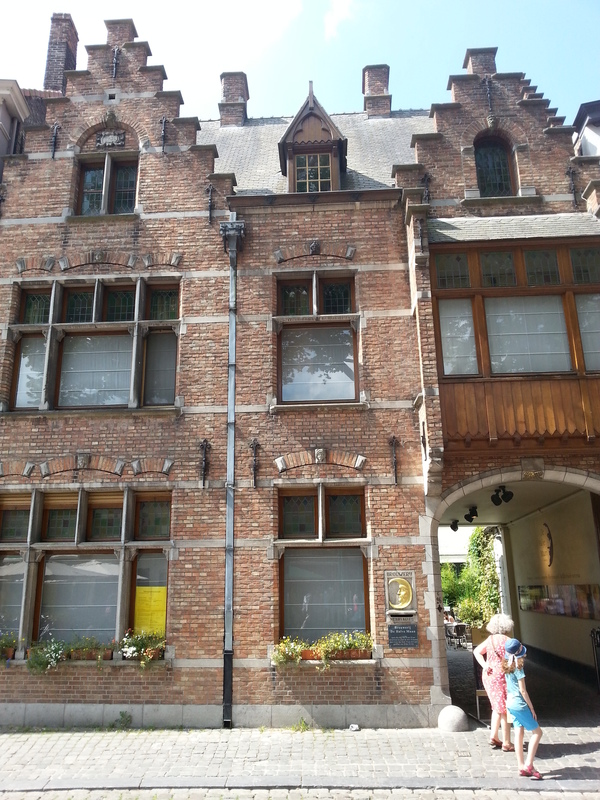 Good write up… we was lucky when we went as their was rainbows going over Bruges when we got to the top … check it out on my first posts about Bruges on my blog http://www.thehalfpintgentleman.wordpress.com … prob easier to go to the travel section! I must admit I love the Straffe Hendrik quad! 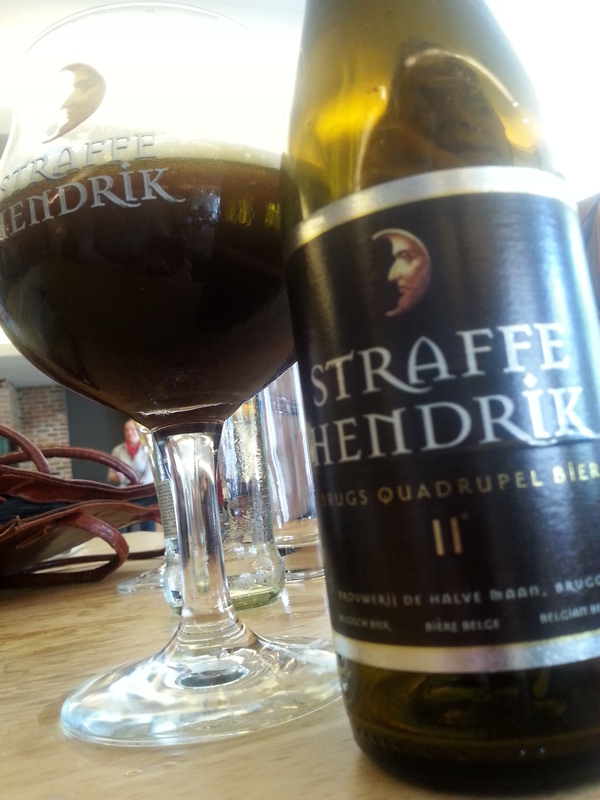 That Straffe Hendrik Quad is far too moreish for how strong it is! Alongside reading The Difference Engine, your blog post has me all nostalgic for steampunk. A shame the tour guide wasn’t wearing brass goggles, a leather apron and a striped hat. 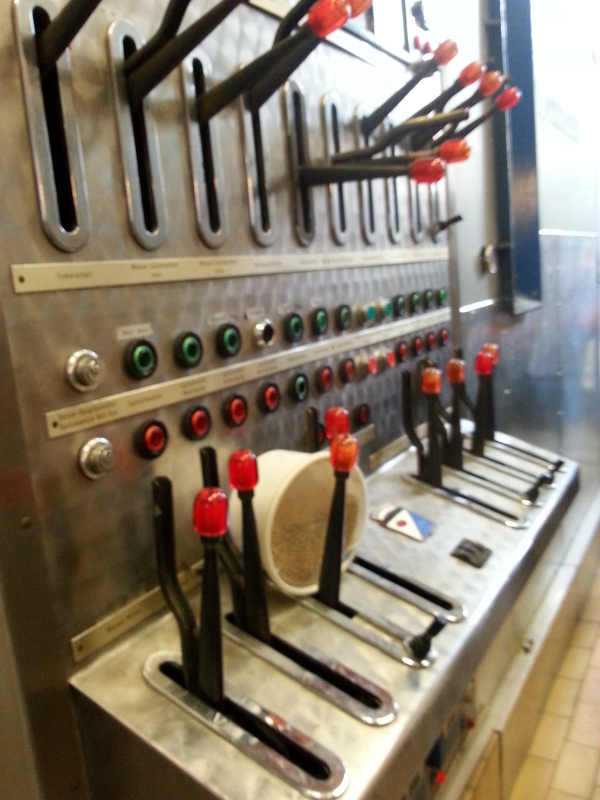 The brewery control unit reminds me of train signal station controls. Yeah, that would have been great. Massive gloves and an enormous gunmetal-coloured wrench for pointing at stuff, with a built-scoop at the other end for sampling the beer.